PRESS RELEASE - THE SOUTH CHINA SEA ARBITRATION (THE REPUBLIC OF THE PHILIPPINES V. THE PEOPLE’S REPUBLIC OF CHINA) The Hague, 12 July 2016 - China has repeatedly stated that “it will neither accept nor participate in the arbitration unilaterally initiated by the Philippines.” The Tribunal concluded that, to the extent China had historic rights to resources in the waters of the South China Sea, such rights were extinguished to the extent they were incompatible with the exclusive economic zones provided for in the Convention. New map boosts China's claim in sea By Wang Junming (China Daily) 2014-07-04 - From the perspective of the UNCLOS, historic title is considered an exception to the applicability of the provisions on sea boundary delimitations. President Xi Jinping is himself is driving China’s controversial island-building and other practices in the disputed South China Sea, according to a Communist Party publication. "[President Xi] personally steered a series of measures to expand [China's] strategic advantage and safeguard the national interests," an opinion piece in the 28 July 2017 Study Times, a paper put out by the premier academy of the Chinese Communist Party, the Central Party School. The article claimed that Xi himself was behind measures supporting the expansion of China's infrastructure work in the sea, sections of which are also claimed by Malaysia, Brunei, the Philippines, Taiwan and Vietnam. "On the South China Sea issue, [Xi] personally made decisions on building islands and consolidating the reefs, and setting up the city of Sansha. [These decisions] fundamentally changed the strategic situation of the South China Sea," the article read. China, which wants control of the entire sea, has seen an opportunity in the South China Sea and taken it, Bill Hayton, a Chatham House associate fellow and South China Sea expert told the South China Morning Post 28 July 2017. "The Southeast Asian countries don't want to be sort of dominated by China; neither do they want to sign up for some kind of anti-China containment policy," he said. "But with the clearly weakened US position in the region… China can just pick off the Southeast Asian countries." China's creation of seven man-made islands in the South China Sea has drawn strong criticism from the U.S. and others, who accuse Beijing of further militarizing the region and altering geography to bolster its claims. Subi, Mischief and Fiery Cross reefs are part of the Spratly chain, which is claimed in whole or in part by China, the Philippines, Vietnam, Malaysia, Taiwan and Brunei. On each of the islands, China has constructed enough concrete hangers for 24 fighter jets and four or five larger planes such as bombers or early warning aircraft. China already used an existing airfield on Woody Island in the similarly disputed Paracel chain, located to the north, where it has maintained mobile HQ-9 surface-to-air missiles for more than a year and deployed anti-ship cruise missiles. The airfields and advanced surveillance and early warning radars will allow China's military to operate over virtually the entire South China Sea. At Foreign Ministry Spokesperson Hua Chunying's Regular Press Conference on January 24, 2017, she said "China's position on the South China Sea issue is clear, consistent and remains unchanged. China has indisputable sovereignty over the Nansha Islands and the adjacent waters. We stand firm in safeguarding our territorial sovereignty and maritime rights and interests in the South China Sea. We are committed to peaceful settlement of the relevant disputes in South China Sea through negotiations with countries directly concerned. China upholds the freedom of navigation enjoyed by all countries under the international law, and peace and stability of the South China Sea. The United States is not a party to the South China Sea disputes. We urge the US side to respect the facts and be prudent in words and actions to avoid causing disruptions to peace and stability of the South China Sea.... China upholds the freedom of navigation enjoyed by countries under international law in the South China Sea, but we oppose intruding navigation that undermines sovereignty and security of coastal countries." Chinese state media warned 13 January 2017 that the US would have to launch a "large-scale war" to prevent Beijing from accessing islands it has built in the South China Sea. It comes after secretary of state nominee Rex Tillerson said such access should be restricted. "Unless Washington plans to wage a large-scale war in the South China Sea, any other approaches to prevent Chinese access to the islands will be foolish," the state-sanctioned Global Times newspaper wrote. It went on to stress that the US "has no absolute power to dominate the South China Sea," warning that Tillerson "had better bone up on nuclear power strategies if he wants to force a big nuclear power to withdraw from its own territories." The former ExxonMobil CEO’s comments were made during his Senate confirmation hearing on Wednesday, in which he said that China's activities in the disputed South China Sea were "extremely worrisome." "Building islands and then putting military assets on those islands is akin to Russia's taking of Crimea. It's taking of territory that others lay claim to," Tillerson said, referring to the reunification of Crimea and Russia, which took place following a referendum in 2014. "We're going to have to send China a clear signal that first, the island-building stops, and second, your access to those islands also not going to be allowed." Tillerson went on to accuse President Obama of being complacent during his tenure, stating that "failure of a response has allowed them (China) to just keep pushing the envelope on this." Shortly after Filipino President Rodrigo Duterte made an insulting remark about American leader Barack Obama [a "son of a whore"] 05 September 2016, Beijing announced it would foster and develop ties with Philippines as an important ally. China demonstrated that it will boost its positions in the region and strengthen ties with allies, said Alexei Maslov, head of the School for Eastern Studies at the Higher School of Economics. "Beijing used the fact that Obama will soon leave office. China showed to the United States that it will prevent an American presence in their zone of interest," he told the Russian analytical website Svobodnaya Pressa. The expert said it was "symbolic" that China pledged economic support for the Philippines right after Duterte’s words about Barack Obama. Therefore, Beijing demonstrated that those who are not with the US will be with China and will receive political and economic support, Maslov said. The Permanent Court of Arbitration (PCA) in The Hague on 12 July 2016 ruled that China has no legal basis to claim “historic rights” to islands in the South China Sea and had violated the Philippines' sovereign rights. "The Tribunal concluded that there was no legal basis for China to claim historic rights within the sea areas falling within the 'nine-dash line'," the Hague-based Permanent Court of Arbitration said. The nine-dash refers to a demarcation line on a 1947 map of the sea, which is rich in energy, mineral and fishing resources. Following The Hague ruling on the South China Sea, Beijing launched a diplomatic charm offensive aimed at solving the dispute through dialogue and consultation with parties directly concerned. "Under no circumstance will the arbitration award exert any impact on China's territorial sovereignty and maritime rights and interests in the South China Sea," Chinese Premier Li Keqiang stressed last Saturday at the 11th Asian-Europe Meeting (ASEM) Summit, as quoted by Xinhua. Li underscored that Beijing remains committed to settling the South China Sea disputes through "dialogue and consultation with countries directly involved" and in accordance with international law. Beijing had not occupied and developed any new islets in the South China Sea in more than 20 years because Chinese leaders feared the consequences. They know that there would be a major diplomatic fallout that would destroy any sense of them being an honest player in the region, and that such a move would be so against the 2002 Declaration on the Conduct of Parties in the South China Sea that it would destroy China's credibility and upset the whole of Southeast Asia. 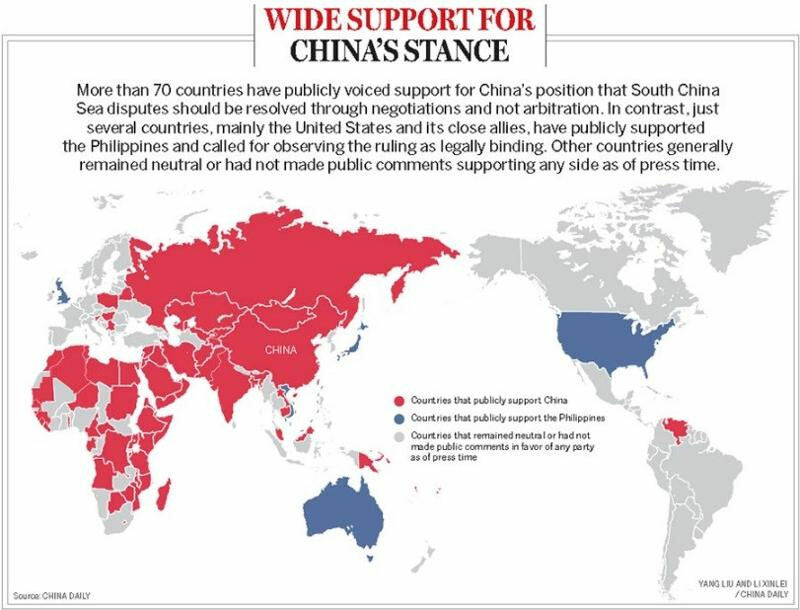 By 2016 Beijing was also counting on support from its allies. China courted Cambodia, flanking the Vietnamese-US relationship. In April 2016 China reached what it called a four-point consensus with Brunei, Cambodia and Laos on the South China Sea [neither Cambodia nor Laos have claims, and the Brunei claim is miniscule]. First, China and the three countries all agree that disputes over some Nansha islands and reefs are not an issue between China and the Association of Southeast Asian Nations (ASEAN), and should not affect China-ASEAN relations. 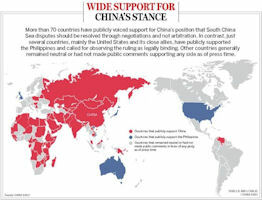 Second, China and the three countries all agree that the right enjoyed by sovereign states to choose on their own ways to solve disputes in line with the international law should be respected, and an imposition of unilateral will on others is opposed. Third, China and the three countries also agree that disputes over territorial and maritime rights and interests should be resolved through dialogues and consultations by parties directly concerned under Article 4 of the Declaration on the Conduct of Parties in the South China Sea (DOC). Fourth, China and the three countries believe that China and ASEAN countries are able to jointly maintain peace and stability in the South China Sea through cooperation. Countries outside the region should play a constructive role rather than the other way round. Beijing secured further support from African nations such as Tanzania, Uganda, Eritrea and Comoros. None of these states have claims in the South China Sea, which runs against China's oft-stated assertion that these disputes should be settled bilaterally by states in the region [ie, without the United States]. On 24 February 2016 China sent fighter jets to a disputed island where earlier in the month it redeployed surface-to-air missiles and appeared to be building a sophisticated radar system, according to U.S. officials. The radar would bolster Beijing's ability to monitor surface and air traffic in the tense waters and “along with the development of new runways and air defense capabilities, they speak to a long-term anti-access strategy by China – one that would see it establish effective control over the sea and airspace throughout the South China Sea. Fewer than 10 jets – a combination of Shenyan J-11 and Xian JH-7 aircraft – have been spotted on Woody Island in the Paracel chain in the South China Sea. In November 2015 Chinese state media published images of J-11 fighter jets on Woody Island. Nina Hachigian, the U.S. ambassador to the Association of Southeast Asian Nations, told reporters, "We are very concerned that these actions are increasing tensions in the region and are counterproductive." The fighter jet sightings followed the placement of HQ-9 surface-to-air missiles on the 210-hectare island, known in Chinese as Yongxing and called Phu Lam by Vietnam, which also claims it. While significant land reclamation work had taken place on Woody Island, it is also undisputably an island for legal purposes, meaning its status is less contentious than some of the features that China has expanded in the Spratlys, for example Subi Reef, which was submerged at high tide before the reclamation work took place. Fiery Cross Reef - China expanding construction of its facilities on Fiery Cross Reef. Beijing completed a 3,000 meter (9,800-foot) airstrip, long enough to accommodate most Chinese military aircraft. Two helipads, up to 10 satellite communications antennas, and one possible radar tower are also present. Reclamation on Fiery Cross Reef, which lies on the west side of the Spratly Islands, began in August of 2014 and its principal landmass was finished by November. South Johnson Reef - This reef was one of the first facilities to finish principal land reclamation. A radar tower was built at the north end of the land mass. A new large multi-level military facility was built in the center of the island. Up to six surveillance towers were constructed alongside four possible weapons towers. Mischief Reef - Beginning in early 2015, Mischief Reef located in the Spratlys saw extensive reclamation activity. The widening of the southern entrance to the reef, coupled with sightings of Chinese navy vessels, suggested a future role for the reclaimed reef as a naval base. Gaven Reef - Significant construction on Gaven Reef began in 2014, with a total of 114,000 square meters of land already created. Satellite pictures show just how fast construction has progressed on the reef. A new artificial island was created between March and August 2014. China had a troop garrison on Gaven Reef since 2003, which has included a large supply platform where ships can dock. "Shelving disputes and carrying out joint development" had been China's basic position on the South China Sea issue. Elizabeth C. Economy notes that "In 2010, Xi chaired the leading group responsible for the country’s South China Sea policy, which broadened its definition of China’s core interests to include its expansive claims to maritime territory in the South China Sea. Since then, he has used everything from the Chinese navy to fishing boats to try to secure these claims ... "
In 2010, China issued an important statement concerning its core interests. Among its core interests was included the “Near Seas” to include the South China Sea (SCS), the East China Sea, and the Yellow Sea. The claim to sovereignty over these seas included the islands, fisheries, and subterranean minerals housed in them. The South China Sea adjoins Guangdong and Hainan Provinces, and Guangxi municipality. The South China Sea is situated in the tropical and sub-tropical zones. It has a vast water area (some 3,500,000 km2) and contains a variety of aquatic species, yet fishing grounds are rather scattered. The territorial concept of the marginal sea - the submerged part of the continental margin or continental shelf - was originally not well developed. The early Romans viewed the sea as open to all people (res communes) and therefore owned or controlled by nobody (res nullius). More recently, the doctrine of res communis (the property of all nations) and the doctrine of res nullius (the property of no one andtherefore capable of being appropriated by the first occupier), have been seen as mutualy exclusive. Over the last 50 years ocean management has generally moved from "res nullius" (no ownership), to "res communis" (community ownership). Beijing's diplomatic stance on the issue of sovereignty has been rigid and inflexible in nearly every case. The Paracel Islands are surrounded by productive fishing grounds and by potential oil and gas reserves. In 1932, French Indochina annexed the islands and set up a weather station on Pattle Island; maintenance was continued by its successor, Vietnam. China has occupied the Paracel Islands since 1974, when its troops seized a South Vietnamese garrison occupying the western islands. China built a military installation on Mischief Reef in 1999. The islands are claimed by Taiwan and Vietnam. The Spratly Islands are in the South China Sea and consist of more than 100 small islands of various types, including coral reefs and sandbars. Some of these features are submerged during high tide. The highest point is 4 meters above sea level. The area is thought to be rich in oil and natural gas, with some estimates being extraordinarily high. Phosphate deposits are also believed to be present. Serious efforts to accurately quantify the natural resources of the Spratlys have yet to be made. The Spratly Islands only have a land area of less than 5 sq kilometers, yet encompass a maritime area of 410,000 sq km, which is almost exactly equal to that of California. The Islands are claimed by five different countries: China, Taiwan, Vietnam, the Philippines, and Malaysia. Under different laws and historical precedents, each party has a basis for its claim. The first three states claim the Spratlys in their entirety, while Malaysia and the Philippines only claim parts. The Spratly Islands are very rich fishing grounds and are frequented by fishing boats from all surrounding countries. Fishermen will often land on the islands to rest. As of late 2003, infantry contingents from the different claimant countries were present on about 45 of the islands. Scientists occasionally visit for various types of research. There are no permanent inhabitants, and the Spratly Islands lack natural sources of fresh water. The discovery of fossil fuels in the Spratlys led to a period of heightened diplomatic and military tensions between the different surrounding states from the 1980's to the mid-1990's. Heads have cooled considerably since then, and the involved parties have agreed to a measures meant to avoid conflict over the area, though the issue of national ownership remains totally unsettled. The South China Sea dispute, of which the Spratly Islands dispute is a key element, has long been regarded by the international community as a potential flashpoint for armed conflict and will remain so if this dispute is not settled peacefully and amicably. The Spratly islands are barren and largely uninhabited. The contending states covet the islands for the “maritime zones” they generate under the law of the sea. Islands generate an extended Exclusive Economic Zone, but rocks and reefs do not. With islands, whoever owns the land also owns the waters. With reefs, it’s the other way around: Whoever owns the surrounding waters, owns the reef. Bill Hayton, author of the book South China Sea: The Struggle for Power in Asia, argued in October 2014 that although Beijing balked at the Hague’s determination, its actions since the summer have been consistent with the ruling. “It is actually complying. It’s just allowed Vietnamese or, Philippine fishermen to go back to Scarborough Shoal,” he said. Hayton added that Beijing’s non-aggression is further evidenced by interactions with Hanoi. Armed clashes seemed a possibility two years ago, when China explored for oil in a part of the South China Sea claimed by Vietnam. “Ever since the 2014 oil rig incident, in which it lost so badly -- Vietnam played a very good game back in 2014 -- China has not drilled for oil in the wrong places,” Hayton said.